Emphasize your love: White Ice Granite White Cabinets Backsplash Ideas. A love circle can be determined when white cabinets and matching backsplash round White Ice Granite. 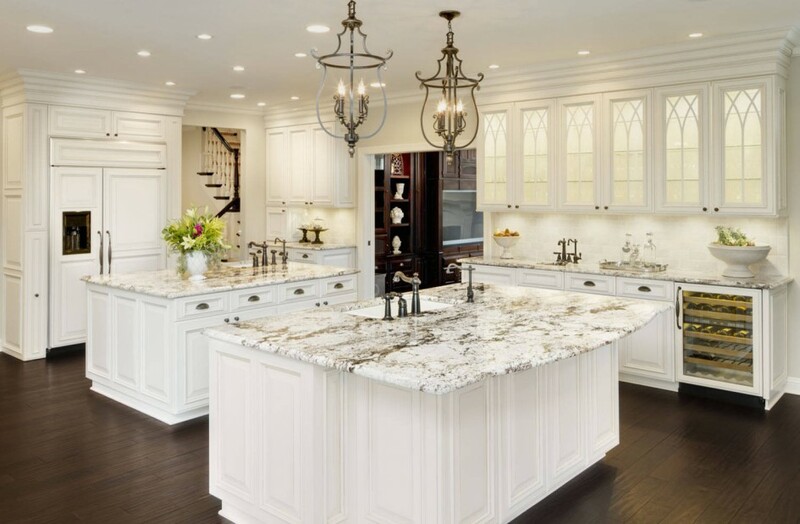 In White Ice Granite White Cabinets Backsplash ideas, you will find out some brown, gray and white tone backsplash color and some green tone borders. I would like to touch the material and the characteristics of the backsplash first. Then, I would like to talk about the color and stain of the white cabinets in this article. White Ice Granite White Cabinets Backsplash Ideas is such a guiding article to visualize your kitchen in your kitchen remodeling process. The material of the backsplash can be ceramic, glass or stainless steel . The type of the backsplash tile would be subway, mini mosaic, arabesque or honey comb. Queen Elsa’s Kind: White Ice Granite can be read if you would like to the full high backsplash. Backsplash color selection tips are still the safe; All natural color backsplash goes well with White Ice Granite. These set of pictures are meticulously picked for your review . White Ice Granite White Cabinets Backsplash Ideas in Pictures. Picture Credit:DFW Improved. These colors will make your spirit up! Matte Ceramic Backsplash is from Walker Zanger, 6th Ave Fog, Julia Mosaic. Cabinet paint color- Sherwin Williams-Snowbound #7004. White Ice granite looks like a jewel . Very well admired design. White Ice Granite with White Cabinets and Dark Color Flooring and Stainless Steel Appliance . Backsplash is Moda Glass Subway. Picture Credit: Ramona Griffin, G&G Interior Design via Houzz. Glazed ceramic beveled arabesque tile matches very well with Benjamin Moore HC-81 Manchester Tan and the glaze is AF-120 Tamarind. The trio of granite, backsplash and cabinets are singing very well in this kitchen. Picture Credit: Black Dog Construction. White Ice Granite seems like a celebrity in this kitchen. All her beauty can be seen in a big countertop surface. The cabinet color is Sherwin Williams SW-7008, Alabaster. The floors were a natural red oak and backsplash is white subway tiles bordered with Bliss 1 Iceland Linear Mosaic. Very good taste in open layout kitchen design. Picture Credit: All Stone Concepts, LLC. ,White Ice Granite with Berkshire Cabinets ( I am still searching the name and glaze of the color) and mini mosaic backsplash . Dark hardwood flooring brings a nice contrast. If you would like to take your turn and drop a comment about White Ice Granite White Cabinets Backsplash Ideas, please do not hesitate. Thank you for your collaboration.